This durable, good-looking stand is made from heavy 12- and 16-gauge steel and can be adjusted from 29" to 35" in height. It comes equipped with levelers to compensate for uneven floors. Plus, the stand has predrilled holes that make it easy to mount accessories and to customize the stand. 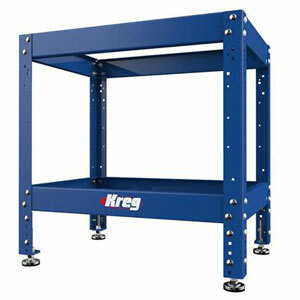 The Multi-Purpose Shop Stand is the perfect foundation for all Kreg® table top solutions, including the Klamp Table™ and the Precision Router Table Top. You can also use it to create a custom tool or work stand for your shop. Includes four (4) leveling feet and assembly hardware. The Fulton Steel Router Table Cabinet features an easy lift handle and two casters on one end to making moving the cabinet easy. On the inside, the cabinet has a unique pull out drawer with multiple compartments and a pre-installed foam router bit tray for storing your most used bits ( tray fits up to 100 router bits). There is also more storage space below the drawer for different accessories. Helps remove dust and keep airflow circulating inside the cabinet. Large Paddle on/off switch for easy access to router power. Keeps the rest of the cabinet clean and enhances the dust collection capabilities. Stands up to every day use. Store accessories like wrenches, collets and more. Store up to 100 router bits. 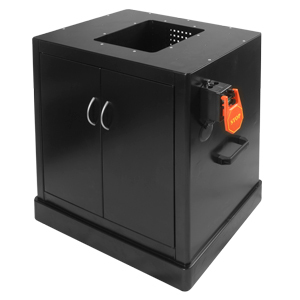 Keeps doors securely shut and keeps them from opening while moving around the shop. 27-3/4" wide x 17-3/4" deep x 34-1/4" tall. (the height may slightly vary depending on how you set the cabinet feet). Note: Additional shipping rates may apply due to being oversized. Peachtree Woodworking will call with any additional shipping cost before your order is processed.